Billiards is a game of geometry and physics, every shot requires the correct angle and the proper force for the desired result of the billiard ball resting in the bottom of the pocket. Because this game is science and math oriented, it is easy to find elements to observe for sports science. We chose to look at the cue ball when it collided with the numbered ball. We chose this sport so that we could look at the transfer of energy, inertia and momentum and how they are a vital part of this game. The way we went about this project was by setting up a video camera on a tripod and placing it on the billiard table. Once everything was situated we hit the cue ball that weighs 6oz into the 9 ball which weighs 5.5oz. We used a measuring stick, which measured 60cm so that we would have a scale for the video. After we had the footage of the two balls colliding, we analyzed it in tracker to find the velocity and acceleration. With that data we found we were able to find momentum, force, and work applied to the billiard ball. First, we found the velocity of the 9 ball after the collision. The velocity was 3.9m/ s. As the ball moved further away, the velocity gradually decreased. The point of greatest velocity was the instant right after the cue ball collided with the 9 ball. The cue ball transferred its motion into the 9 ball but their velocities are not the same. Because the cue ball struck the 9 ball at an angle, not all of the energy was transferred; some of it was still in the cue ball allowing it to continue rolling on the table. This is not always the case though. Depending on where you strike the cue ball, many different results may occur. If the player hit the cue toward the bottom half of the ball, it will cause the cue ball to either stop or spin backwards depending on how hard it was hit. If the player hits the ball on the top portion of the cue ball, it will cause it to role forward after making contact with the other ball. Depending on where and how hard the player hits the cue ball determines the result of the collision. Second, we found acceleration. Acceleration of the 9 ball the instant after collision occurred was 41.78 m/s2 and rapidly decreased the next few instances. 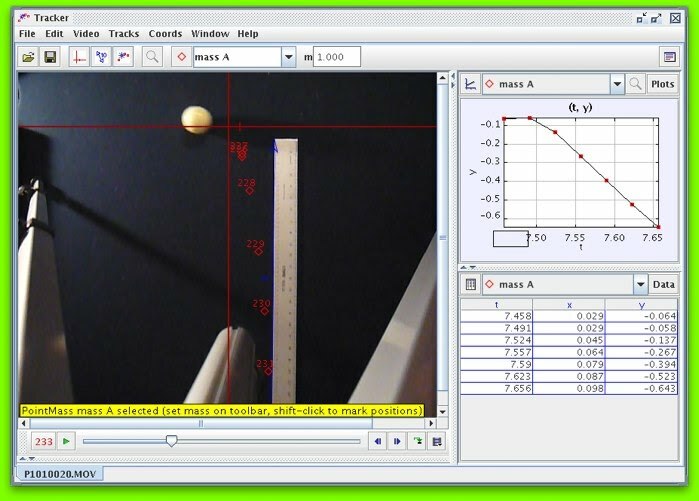 After the 9 ball had been struck, its acceleration pecked because it went from 0m/s2 to 41.78m/s2 but due to friction of the felt on the table the ball starts to slow down. Once it hits one of the side rails, which is composed of a foam cushion, the ball bounces off causing it to lose a considerable amount of force, not only because its coming in contact with another surface but because it also changes the velocity and direction of the ball. Third, we found the force of the ball. For this we used the equation F=MA the mass of the 9 ball is 5.5oz and the acceleration of 41.78m/s2. The force of the ball came out to be 229.79N. 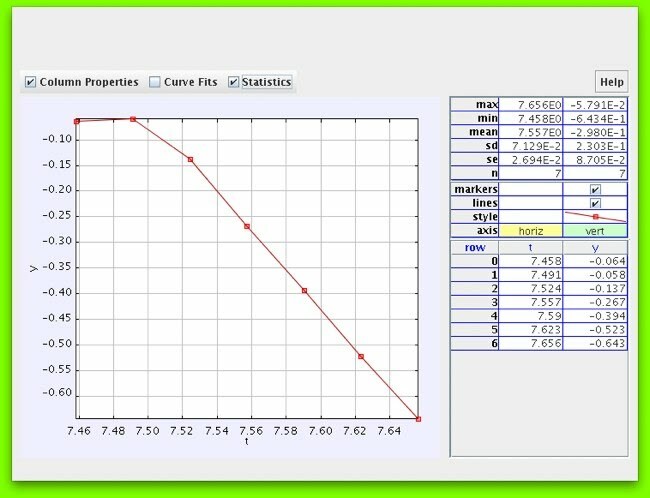 We also calculated momentum by using the formula P=MV with M= 5.5 and V= 3.9 the momentum of the 9 ball was 21.54m/s. The 9 ball’s momentum is a direct reaction from the cue ball collision however, some of it is lost due to contact and the angle of the collision but a large part of the cue ball’s momentum is directly transferred into the 9 ball. In order to find the amount of work performed on the 9 ball, we measured the ball’s placement before and after collision measuring the distance the ball traveled. The displacement of the 9 ball was 5.83m and the force was 229.79N so the amount of work exerted on the 9 ball was 1339.6757J. What we discovered by doing this project, was that depending on the way you strike the cue ball and the force you put behind it directly affects the way the cue ball and the 9 ball will react after impact. The majority of the energy that the cue ball contains is transferred into the 9 ball causing work to be done. Through that work, a force is applied resulting in the 9 ball’s acceleration, change in velocity, and the momentum to keep the 9 ball rolling on the table even after colliding into the rail. Through understanding how all these elements come together and work simultaneously, the player can learn how to properly strike the cue ball to get that perfect result of the 9 ball resting in the bottom of the pocket.